Tuft & Needle offers an all foam mattress that aims at being a good fit for all sleeping preferences. They’ve gone through a few different designs over the years, so I’m interested to take a look at the current iteration. Want to find out if the Tuft & Needle fits your sleeping needs? Read on for my full review! Tuft & Needle started relatively early in the online mattress craze (2012) with a goal of improving the mattress shopping experience and offering mattresses at a lower more transparent cost. 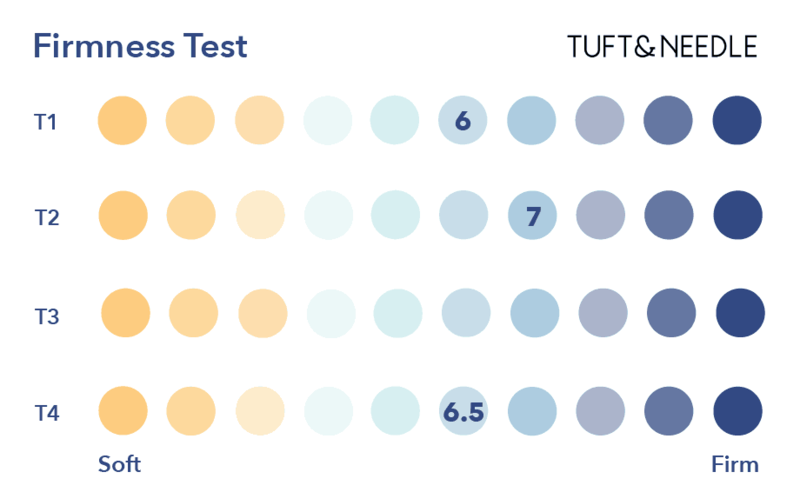 These days Tuft & Needle still stands out because it is priced significantly lower than nearly all of the other most popular online mattress brands. The company created a single mattress that aimed to serve all consumers, regardless of sleeping preferences. To make a mattress with such a wide appeal Tuft & Needle broke down what makes a quality mattress into support, pressure relief, and cooling. 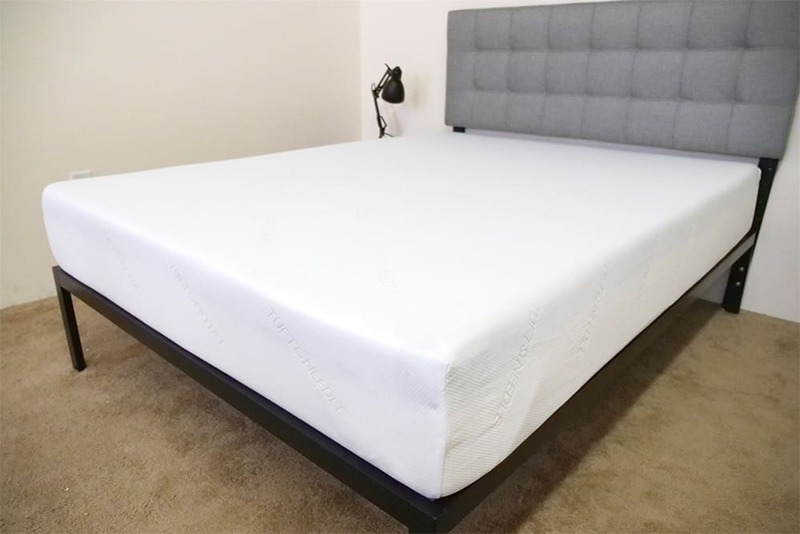 The founders leaned on their tech backgrounds to develop the mattress, using feedback on their prototypes to tweak the construction, and produce a new version for testing. 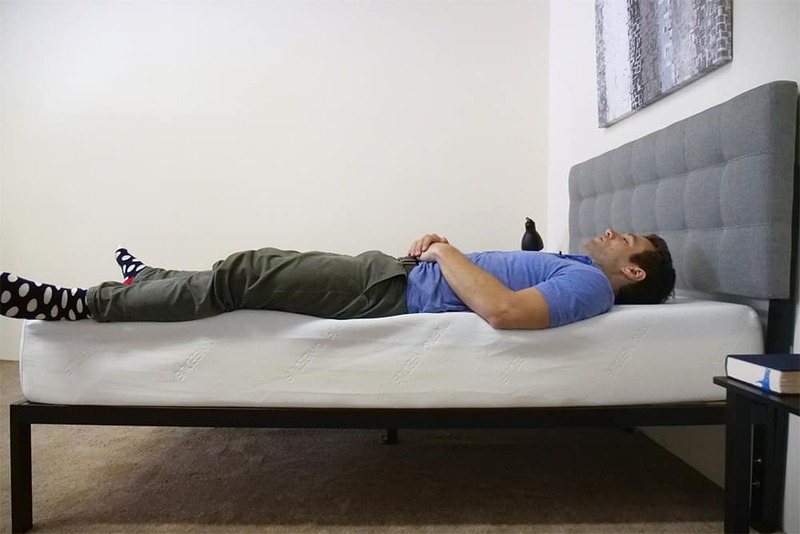 After a number of iterations and the development of their own proprietary foam, they believe they have found a mattress that the masses will enjoy. 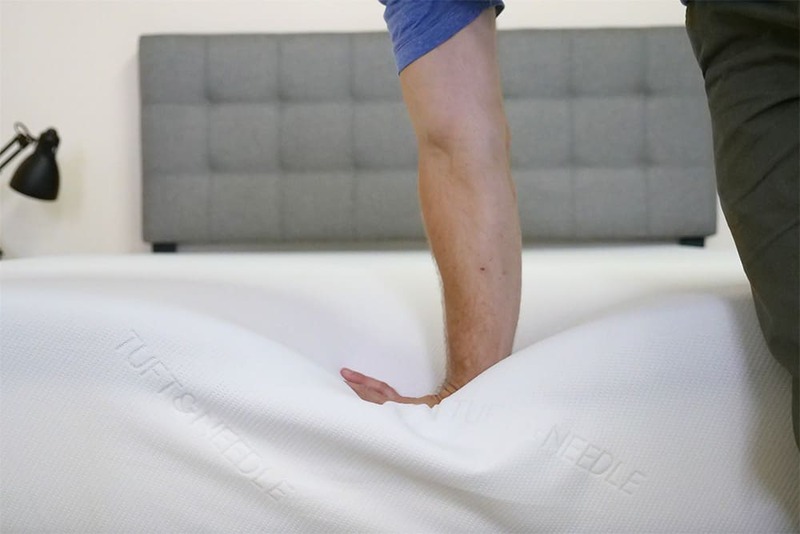 If you would like to try the mattress before purchasing, Tuft & Needle has continued to innovate on the mattress shopping experience by partnering with Amazon to open new retail locations. These locations offer free two-hour delivery through Amazon Prime, and you can even order through the Amazon app on your phone by scanning a barcode located next to the product in the store. Now, onto my review. Lost on your mattress journey? Check out my mattress reviews overview. 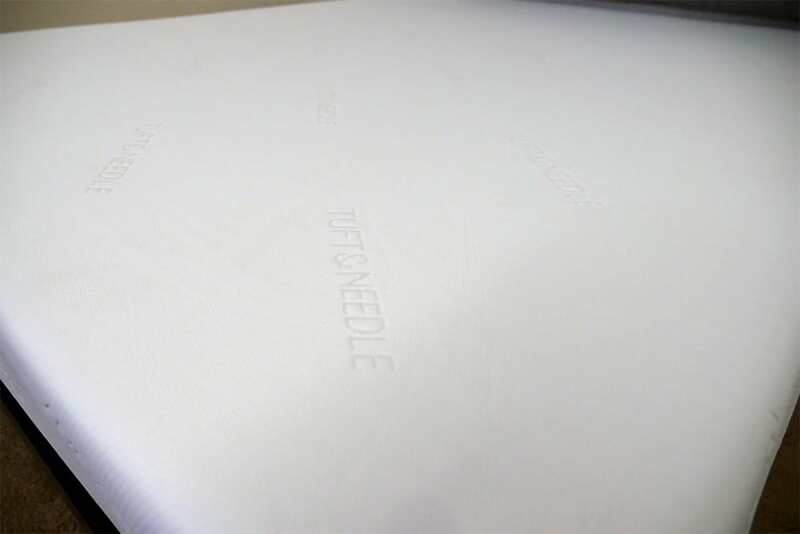 The Tuft & Needle mattress is a straightforward construction of two foam layers used to create a general feel that can appeal to a wide range of sleep preferences. When I first take a look at the layers of the mattress I notice that the feel of the mattress is going to be heavily influenced by the comfort layer, which is made of Tuft & Needle’s proprietary foam. Cover – The cover is a stretchy Polyester/Tactel blend. It is thin by design, which allows air to flow through the mattress to help with temperature regulation. Tactel is used as a cotton substitute and can be found in a lot of clothing. As a material, Tactel dries a lot quicker than cotton does, so this will further aid in temperature regulation for the mattress. Comfort Layer – The comfort layer on the mattress is made of 3 inches of Tuft & Needle’s proprietary foam, a poly foam with a 2.9 lb density. This layer of the mattress provides pressure relief and generates the overall feel you will have while lying on the Tuft & Needle. 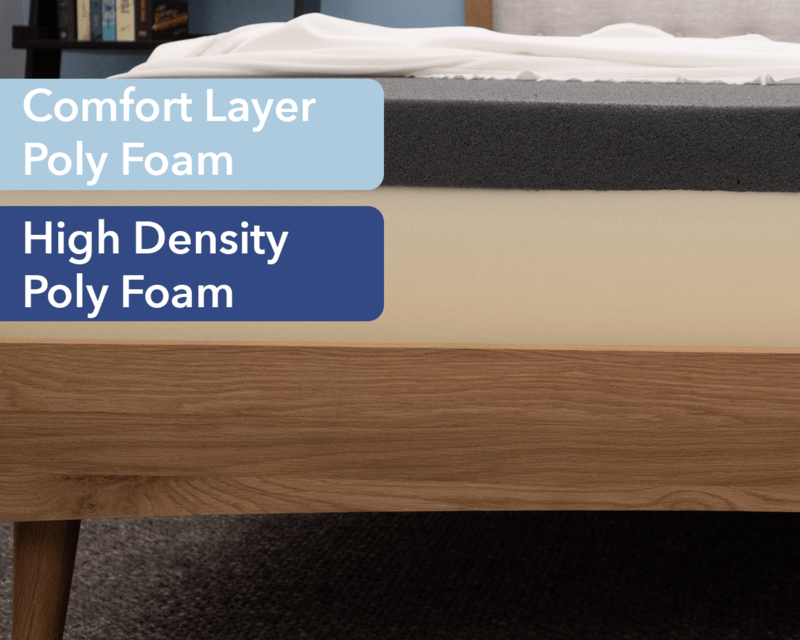 The foam in this layer responds pretty quickly to pressure, providing good bounce to the mattress, and ensuring you won’t feel stuck while lying down. Base – Immediately below the comfort layer is the base, consisting of 7 inches of poly foam with a density of 1.8 lbs. This is the foundational support of the mattress, lending durability and shape to the structure. When I first press into the Tuft & Needle I feel the top layer is pretty soft, with a quick response to pressure. This leads me to believe that I will be able to move around pretty easily while lying on the mattress. As I push further into the mattress I start to feel the firm base layer, which acts as the support layer of the mattress. Before moving on, I want to note that there is no transition layer between the comfort layer and base layer of the Tuft & Needle. This is important as, depending on how you sleep or your size, you may feel the firmness of this mattress differently because of the quick switch between soft and firm layers. Given the fact that people of different body types and shapes will feel firmness differently, rather than giving just my opinion on the overall firmness level, I enlisted three other people to give their opinion of the Tuft & Needle as well. This will give you a better sense of the firmness range you can expect. All of the testers for this portion of the review found the mattress to be squarely in the medium firmness range. This level of firmness means that the Tuft & Needle should provide a general feel that would fit for most people. As long as your preferences aren’t too specific, this mattress should be a decent fit. I found the Tuft & Needle to provide pretty good pressure relief, thanks to the soft comfort layer. I was able to change positions without interference and felt that the mattress has quick response to changes in pressure. Also, when on my stomach, I felt that the mattress did a good job of keeping my hips from sinking in and putting my back in a bad position. Looking for a firm mattress? Check out my firm mattress top picks. Instead of just describing the feel of the mattress, I wanted to give a visual representation of where pressure points may form while lying on a Tuft & Needle. To do this, I placed a pressure map on top of the mattress and lied on my back, side, and stomach. On the image below pressure will be represented from blue (low pressure) to red (high pressure). When first lying on the mattress on my back my weight is pretty evenly distributed. This even distribution leads to the low pressure across my body shown in the image above. I felt well supported here, and my lower back was supported, which is great for back sleepers. Once I rolled onto my side I interact a bit more with the base of the mattress. This is due to the higher weight concentration, over a smaller surface area in this position, pushing pushing further into the mattress. This causes me to feel the Tuft & Needle as a bit firmer than when I was lying on my back. The pressure map shows a general increase in pressure, with some higher pressure at the hips in this position, but overall this is in line with other foam mattresses I have tested. By turning onto my stomach I again evenly distribute my weight and the pressure map shows low pressure across my body. It’s important to have low pressure on your chest in this position, to ensure you can breathe easily, and the Tuft & Needle shows good results in that area. If you plan on sharing your bed with a partner, the ability of a mattress to isolate motion can be very important. We set up this next test to show the intensity of motion detectable from one side of the mattress to the other when someone gets into and out of bed or tosses and turns during the night on the other side of the mattress. I was interested to see how the Tuft & Needle proprietary foam would perform on this test, and it did not disappoint. The 4 inch drop shows a great result with a small spike in disturbance felt across the mattress. The disturbance from the 8 inch drop, while larger, is still a good result and the disturbance cuts off fairly quickly. 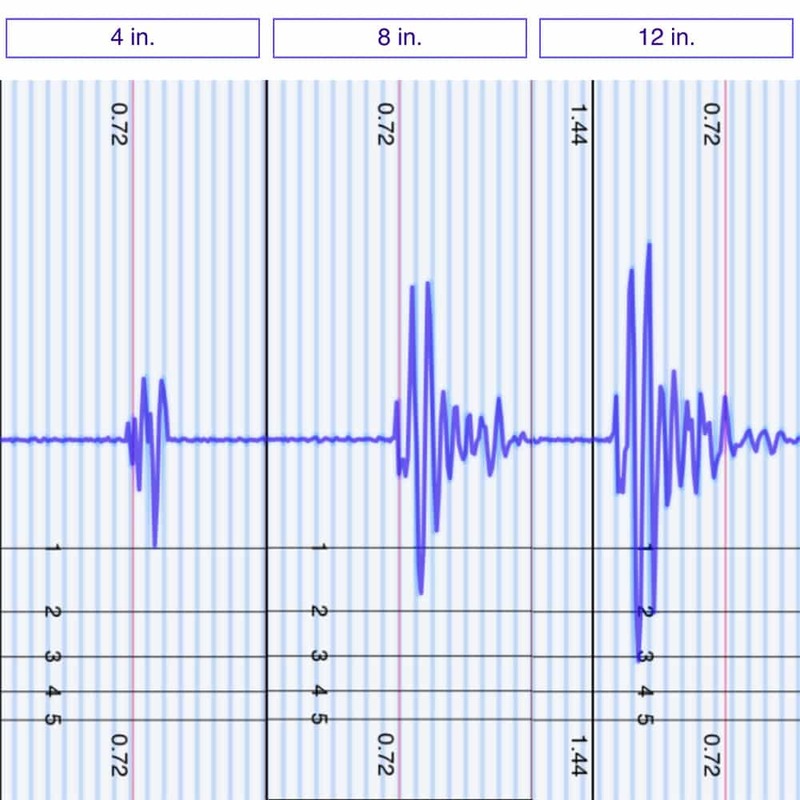 The 12 inch drop, which simulates someone falling or jumping into bed, shows the biggest spike, as expected, but stays well within reason on the seismometer. Partner problems? Check out my best mattress picks for couples. Depending on personal preference, people may prefer to feel more on top of a mattress or sink into it. 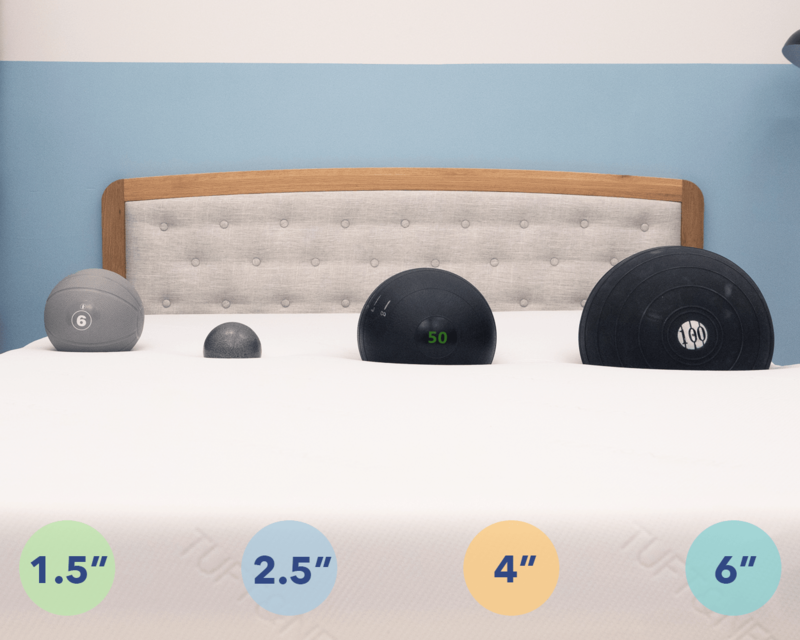 In order to get a good idea of how someone might sink into the Tuft & Needle, I use four balls of varying sizes and densities (a 6 lb medicine ball, a 10 lb steel ball, a 50 lb medicine ball, and a 100 lb medicine ball) and placed them on the mattress to measure how much they compress the surface. 50 lb steel ball: 4 inches of sinkage. If you’re going to share your bed, and need to use the entire surface area of the mattress, then edge support is something you are going to want to take a look at. Foam mattresses sometimes struggle to live up to the edge support of traditional innerspring mattresses, so I wanted to have a look at how I would feel near the side of the Tuft & Needle. Lying on my back near the edge of the mattress, I felt even support from the center of the mattress to the side. As you can see in the image above, there was a bit of compression of the top layer seen at the heavier parts of my body, but I still felt secure while lying on my back. I was also able to shift and change positions without feeling like I would roll out of bed. While lying on my side, you can see that the Tuft & Needle kept my back aligned well. There was a bit of compression at my hips and when hanging off the mattress a bit, but that is pretty normal. By sitting up on the edge of the bed I am concentrating all of my weight on one area of the side. You can see that this causes a good amount of compression, which is to be expected among foam mattresses. This position simulates getting your shoes on in the morning or getting into bed at night, and may not be the most important when it comes to buying a mattress, but does a good job of showing what high weight concentration on the edge can do. Warranty: This mattress carries a 10 year warranty. Is the Tuft & Needle right for you? Now that we’ve taken a deep dive into the Tuft & Needle mattress it’s time to discuss who I think would benefit most from buying it. No Frills: The Tuft & Needle has a basic bed in a box design, with the comfort layer directly over the base layer. The straightforward construction provides a good sleeping surface, without all the bells and whistles. Foam Feel with Bounce: As discussed earlier in the review, the mattress is an all foam construction. 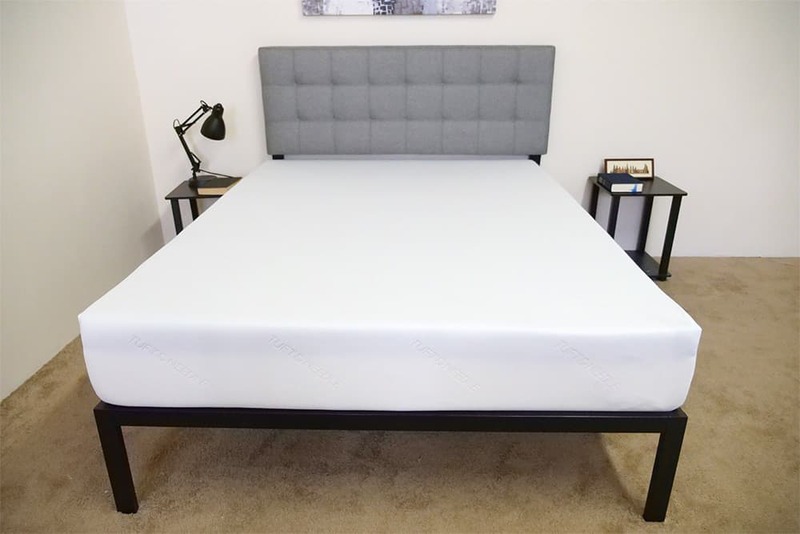 The Tuft & Needle proprietary foam feels more like a latex foam than a memory foam to me, so it provides good bounce to the mattress, allowing you to adjust positions easily. Good Mattress on a Budget: Tuft & Needle ship directly from the factory to the consumer, which helps keep prices down. Easy Shopping Experience: Tuft & Needle have strived to make the mattress shopping experience as simple as possible from the beginning. To continue this effort they have partnered with Amazon to both open retail stores and sell the mattress directly through Amazon Prime. 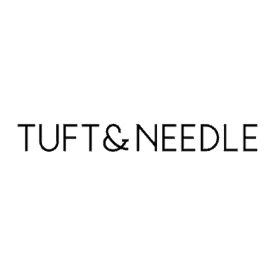 For more information on Tuft and Needle check them out on Amazon.